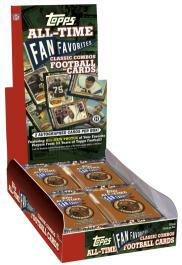 The recently announced Topps Fan Favorites Football (Classic Combos Ed. ), releasing February 30th, will feature autographs from 92 of some of the most beloved players to step onto the gridiron. Almost 40% of the players are signing for a card set for the very first time. Each 6-card pack carries a $5.00 SRP and each 24-pack box guarantees two autographed cards.